In this business you look for bread crumbs and settle for what the pigeons couldn’t get that day. The meeting with Max Gordon in his office was brief. I hadn’t even made a move toward the door. Simon would go on to earn a Pulitzer Prize, be nominated for 17 Tony Awards (win three), and be nominated for four Oscars. May you find (or give) breadcrumbs of encouragement in the coming days. That playhouse—which first opened in 1939— is still operating and tonight the play Million Dollar Quartet (book by Colin Escott & Floyd Mutrux) begins at 8:00. I’m not sure how long Koontz was a school teacher but in 1968 he had his first book published and since then has written enough books to be named by Forbes as one of the top ten best-paid authors. More than ten of his stories have been made into films or TV movies. It’s three for one day here at Screenwriting from Iowa as I’ve pulled three quotes by Koontz from his book Writing Popular Fiction. Koontz has written thirty plus New York Times best sellers and more than 200 million books so if you’re looking for advice he’s a solid source. FYI—Koontz has an excellent website including podcasts. You hear a lot about Main St. these days and I thought I’d explore what that means from a screenwriting & filmmaking perspective. A couple days ago my travels took me to northern Illinois and to the town of Woodstock which happens to be where much of the movie Groundhog Day starring Bill Murray was filmed. The above photo is the corner where Ned confronts Bill Murray’s character again and again and where Murray steps off the curb into the puddle of water. 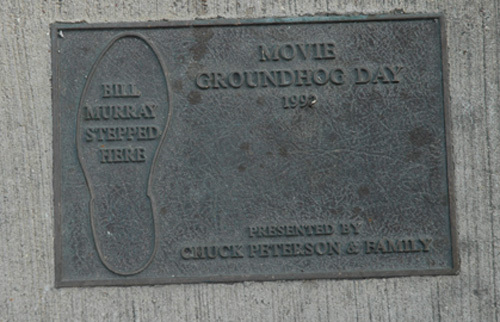 The town, which is about an hour north east of Chicago, has improved much over the last 15 years and continues to embrace the fact that Groundhog Day was filmed there. That’s right, Woodstock doubled for Punxsutawney, Pennsylvania. 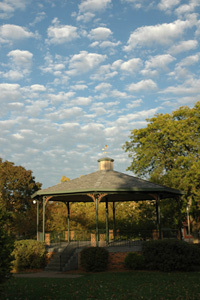 Director Harold Ramis thought the town square there worked better as a location than the real deal. I wonder how many people go out of their way to go to Punxutawney and are disappointed that it doesn’t look like the town in the movie? That’s showbiz. 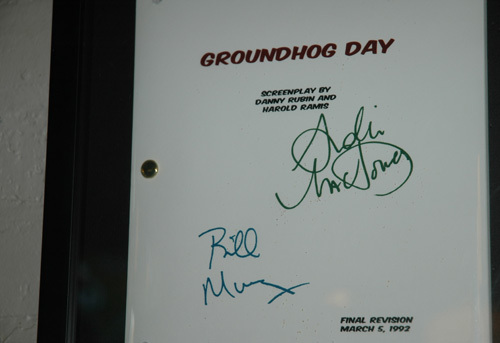 In fact, the town even has a life-imitating-art groundhog day celebration and a nice map you can follow to see the various filming locations of the Danny Rubin and Ramos screenplay. The bar scene where Bill Murray and Andie MacDowell drink to world peace is now the Courtyard Grill and has a signed script on the wall by where they sat. Certainly, if you’re in the area it’s worth it to stop to see where one of the great comedy films (#34 on the AFI Greatest American Comedy list) was filmed. 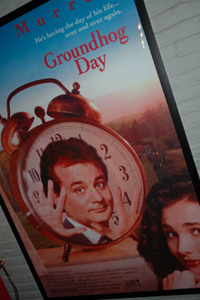 If you’re there at the beginning of February you can even take part in the groundhog days celebration. From my home where I am typing this I can see Main St. here in Cedar Falls, Iowa. It’s just a block to the west and is quite a lively Main St. USA. Shops, a playhouse, art galleries, several bars and restaurants (a new one opening next month will feature a respected Chicago chef) and even a comedy club. It’s also worth a stop if you are ever driving the Avenue of the Saints between St. Louis and St. Paul. There’s something endearing about Main Streets in general. Of course, sometimes they aren’t even called Main St., but they are the historic main road through the heart of smaller towns. It’s not hard for me to think back at some of my favorite main drags (Telluride, Colorado, Winter Park, Florida., Franklin, Tennessee,, Holland, Michigan, Lake Geneva, Wisconsin, Seal Beach, California, Gettysburg, Pennsylvania and Galena, Illinois). I first became aware of this while a student at the University of Miami in the ’80s when two Miami architects (Andres Duany and Elizabeth Plater-Zyberk) began to design the beach community of Seaside, Florida. (Seaside is so idyllic, it is where they filmed The Truman Show.) The success of Seaside has been well documented. 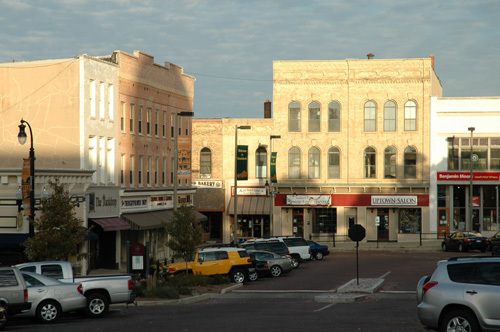 “Most of the buildings were studied in the context of small towns, and gradually the idea evolved that the small town was the appropriate model to use in thinking about laying out streets and squares and locating the various elements of the community. Seaside is a great place and today you can go throughout the country and find other areas that were designed in its wake; Celebration, FL, Baldwin Park, FL, Harmony, FL, Prospect New Town in Boulder County, Colorado, and Kentlands in Gaitherburg, Maryland. That is not to say that this new urbanist master planned communities idea doesn’t have its critics. The most common charge is they say the towns are more like film sets or some kind of fantasyland — sentimental and far removed from reality. Some felt it a little strange when Thomas Kinkade (The Painter of Light) got into the act outside the San Francisco Bay area by inspiring a development called The Village at Hiddenbrook that feature homes that would be at home in one of his glowing paintings. Where are the Rod Serling/Twight Zone inspired writers on that one? But for many (including Walt Disney, and perhaps Kinkade) small towns represent the ideal. (Community, honesty, fullness of life, etc.) The way life ought to be, or the way it was. Many movies and TV programs tap into this mystique: It’s a Wonderful Life, American Graffiti, The Last Picture Show, My Dog Skip, The Andy Griffith Show, Cars, To Kill a Mockingbird, The Truman Show, Northern Exposure, Places in the Heart, and Hoosiers. (And some books, films and songs are critiques and satires of small town living such as Pleasantville, Harper Valley PTA, and Sinclair Lewis’ Main Street. On a closing note, I remember when I lived in L.A. there was a popular radio host named Dr. Toni Grant who used to encourage her callers/listeners to write the script of their life. I always thought that was an interesting concept and worth exploring as you take a few more trips around the sun.